I’ve been seeing Bawai’s Vietnamese Kitchen over and over again when I was researching for our holiday to Tagaytay. As much as the great concept and the good reviews received of this family-run restaurant, I never planned on going there since the Greek Mister isn’t a big fan of Vietnamese cuisine. To my surprise, my aunt brought us there on our first day in Tagaytay so hooray for me! I love Vietnamese cuisine and I was so thankful that my aunt thought of this place since the Greek Mister can’t say no to her. Hah! We came straight from the airport to Tagaytay and immediately went to Bawai’s Vietnamese Kitchen which is actually not in Tagaytay zone anymore but in Silang, Cavite. If there is one description which literally fits this restaurant, it is that it’s a hidden gem. Quite literally. It was a bit hard to find specially when you’ve become aware that you’re traversing a rather off-the-beaten path roads of Cavite. Several times I thought we were lost but we never ever give up on something specially if there’s a promise of good food in the end. When we finally reached the restaurant, I was quite surprised to find a house. A real house. I felt like we were trespassing a private property. The house had a 6-car garage and the restaurant was perched on the second floor. I was extremely tired from the trip so I’ve forgotten to take photos of the restaurant itself. You’ll just have to trust me when I say that it’s absolutely unique and offers a very cozy and homey ambiance. It is recommended to make a reservation prior to arriving as there are very few tables available. Also, you have to request your orders as soon as you’ve made the reservation since they don’t function as a normal restaurant which has a huge stock of ingredients. Whatever you’re going to order will be prepared on the day of your arrival, which probably includes buying all the ingredients for your dishes. This dish was one of my favorites! 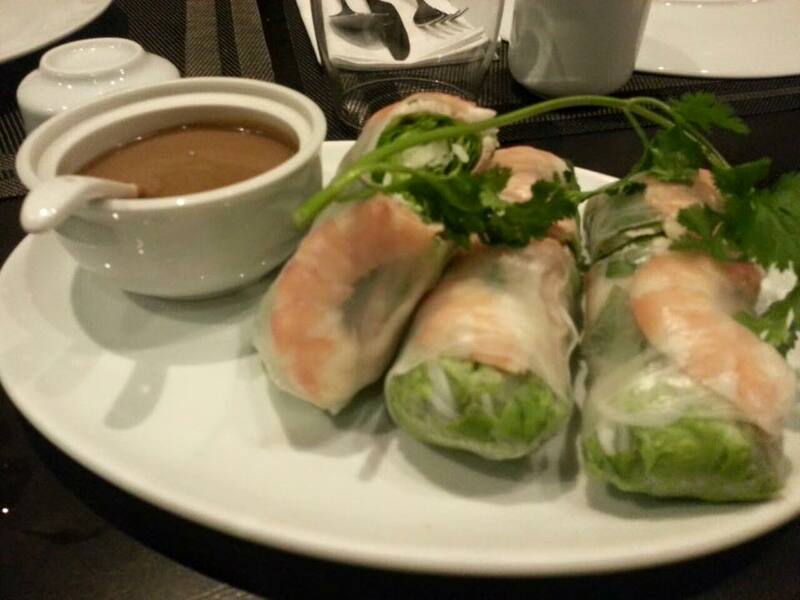 I specially love the tamarind sauce which was new for my taste buds. 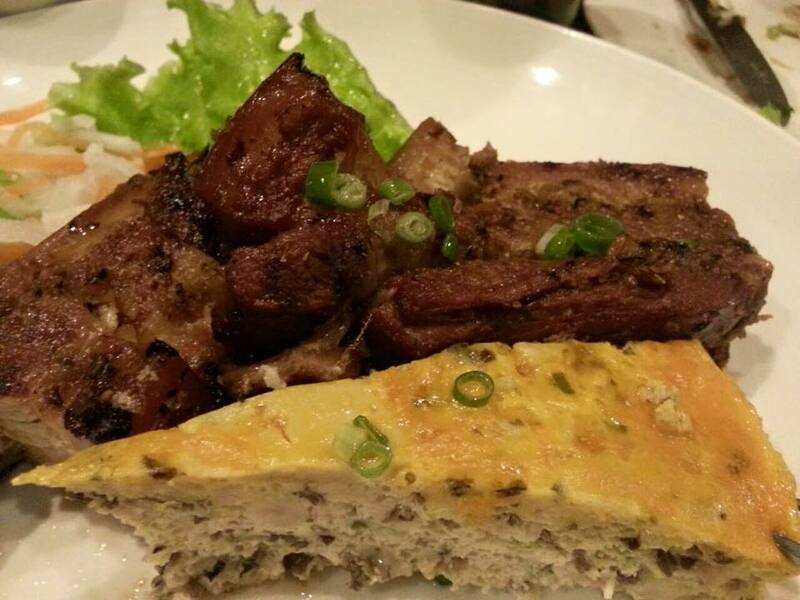 Grilled Pork Liempo with Mushroom Egg Pie and Greens. And of course, this grilled pork was the highlight of the evening for me. It was so good that even the Greek Mister had to agree with me. We ordered a lot of other dishes however I wasn’t able to take photos of all of it. As I’ve said, I was extremely tired from the 12-hour flight we just took plus the drive from NAIA to this restaurant that I was not in my best blogger form when I arrived in Bawai’s. All I remember was the restaurant itself was truly a unique experience for me, the food was hit and miss while the service was a bit slow. But it’s probably because it was busy night for them, being a Friday night. Will I ever go back to Bawai? Oh yes! Definitely. And I’ll make sure I’d be in tip top shape on my next visit to enjoy it more.